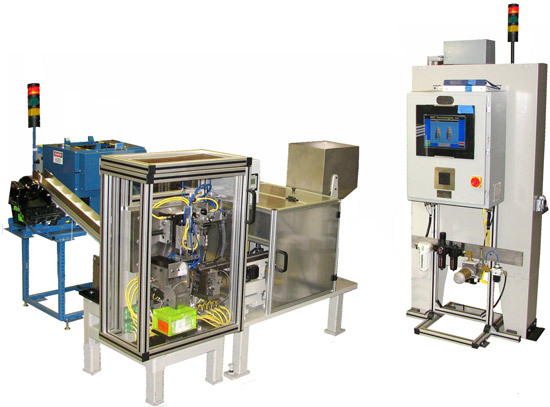 CDS Manufacturing designed and built this machine to inspect automotive Fuel Pressure Connector Bodies. This fully automatic system uses a vibratory bowl feeder and Eddy Current technology to sort out defects including cracked parts, undersized threads, missing threads, deformed features, long parts, short parts, bar ends, material defects, chamfer deviations, and soft parts. Good parts are fed via a cleated conveyor to an automatic tote handling unit for packout. Optional Equipment Available Yes. Floor mounted hopper / elevator, automatic part packaging system.